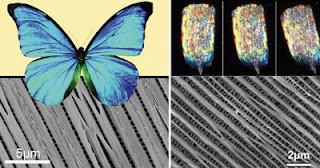 Scientists in China have made zinc oxide replicas of single scales from butterfly wings to understand and exploit their optical properties for sensor and solar cell applications. Butterfly wings are made up of chitin scales and their iridescent blue and green colours are generated by light and air travelling through the chitin. The way the scales are arranged dictates which colour is seen. Studying the wings' properties to replicate the process could lead to the design of new photonic crystal structures for optical devices. Until now, researchers have focused on making devices based on whole butterfly wings, but Jiajun Gu and Di Zhang from Shanghai Jiao Tong University and their team, believe that this misses important mechanisms and phenomena. This is because whole wings are covered by redundant parts, such as wing membranes, which could alter the optical properties of the wings' scales. Photonic crystal structures can control light reflectance, so have the potential to be applied in optical computers, as well as sensors and solar cells. But they are hundreds of times smaller than the diameter of a human hair and are difficult to fabricate. This creates a bottleneck in the process of understanding them and their applications. 'If the structures can be made similar to photonic crystal structures borrowed from natural species, novel photonic crystals that are unavailable through traditional artificial methods can be fabricated,' say Gu and Zhang. The team used individual butterfly scales as templates to create the zinc oxide replicas. 'It's like a natural fossilisation process, but by doing it in the lab, we can make it faster,' say Gu and Zhang. They studied the way the replicas reflect light. Changing the angle that the light hits the scale reduces the reflectance intensity by a factor of ten, and the replicas' optical properties matched those of the original scales. Gu and Zhang hope to explore novel uses for the structures in light manipulation and colour display.